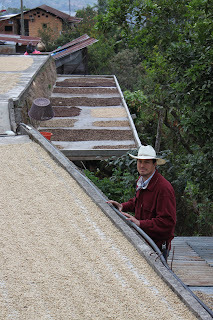 After having enjoyed the extremely clean and balanced coffee from Finca Vista Hermosa since we started our company in 2007, finally I got the chance to visit the Finca in Huehuetenango, Guatemala. I had the pleasure of travelling with Thomas Sigfred who has two coffee shops in Aarhus. called Sigfreds Kaffebar. In my view they have for many years been one of very few coffee shops in Denmark that has developed a solid barista culture. And Thomas work there has inspired lots of peolple both costumers, employees and other people in the business. I was very curious to see the place where the Finca Vista Hermosa coffee is produced and meet the people who produces it. After 3 days of travelling (including an unforeseen night in Miami because of very slow immigration process there) finally we reached Finca Vista Hermosa monday 5th of March in the afternoon. What stroke me as the first thing was how impressing the mountains looks in Huehue. I have seen coffee at similar altitudes in other countries but the heigth difference between the valleys here and the top of the mountain I have never seen similar. That really makes the mountains of the Huehue region look amazing! When we arrived at the finca we started out with a good hike around the lots that we have been buying through the years as Cipresal, Sabinal, Edlyna and the Vista Hermosa lot. It is always a good reminder of how much effort is put into producing the coffee when walking around and see how steep the slopes that the trees are growing on can be. It is definitely not an easy task keeping these trees healthy and picking their cherrys. Tuesday we got the chance to cup samples from what had been picked on the different lots of Finca Vista Hermosa so far. We cupped together with Edwin and it was his first time cupping the samples of this harvest as well. I was really impressed and exited about the cupping, since there where quite a few very clean, sweet and balanced lots but also some special ones with very delicate Fruity and Floral aromas which I haven't found to that degree in any other Guatemalan coffee before. Very distinct citric tones in one lot and bergamot notes in another. I found this very interesting since normally I have only tried that elegant and well defined fruity (elegant fruity notes not fruity as on the edge to fermented) or floral notes from coffees of the Kenyan SL varieties, Ethiopian undefined varieties or the Gesha variety. At Finca Vista Hermosa they grow none of these. On the lots with these special aromas was Caturra, Catuaí, Bourbon and Arabigo. It seems to me that in general from what I tried this year the crop is the best that I can remember from Guatemala! Now I just hope that these fantastic aromas arenot to fragile to make it through the milling and exportation system Guatemala. What made this origin visit extra exiting for me was the hospitality of Edwin Martinez and his family. It is rare to get the oppotunity to stay in private homes all through an origin visit. The Martinez familiy where so kind as to host us in Edwins Grand Parents house in Guatemala City, in his parents house in Huehue and at the Finca. 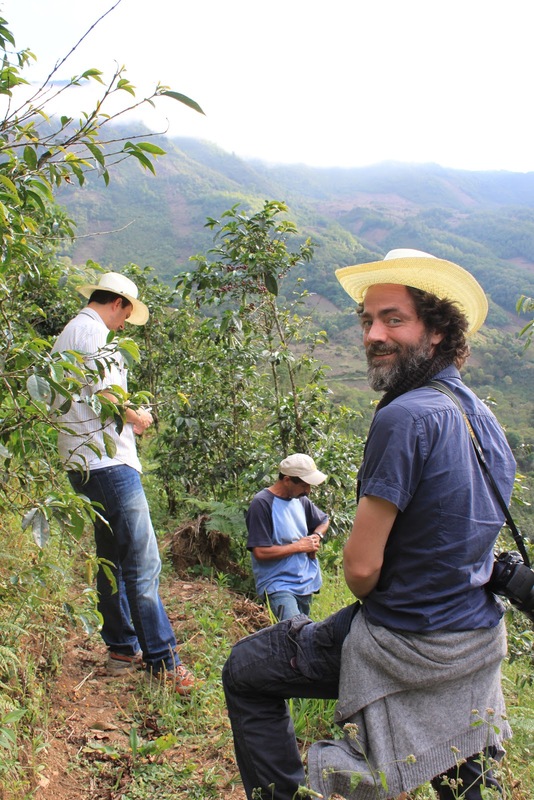 Thank You, Edwin for all Your hospitality, the friendly and inspiring talks as well as all Your work during the year to make coffee from Finca Vista Hermosa as well as from other producers in Huehuetenango recoqnized in the industry of specialty coffee for their extremely high quality!